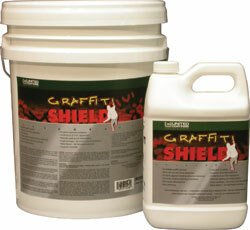 Graffiti Shield is designed to seal previously painted substrates to help minimize the effects of vandalism by facilitating its removal. The product is a two-part system that provides both a protective clear coating and a spray-on cleaner. It helps remove aerosol spray paint and permanent markers, as well as dirt, soot, and pollution. It is packaged in two containers that combine to become a water-based product workers can clean from brushes and spray equipment with soap and water. Workers can apply the product using a brush, roller or airless spray equipment. It is not recommended for use on bare wood or ceramic tile.